We can cater a variety of dessert treats that’ll quench your Bay Area Ice Cream Sundae Catering & Silicon Valley dessert catering needs ~ Y-U-M!!! Flavors, Flavors, Flavors!!! 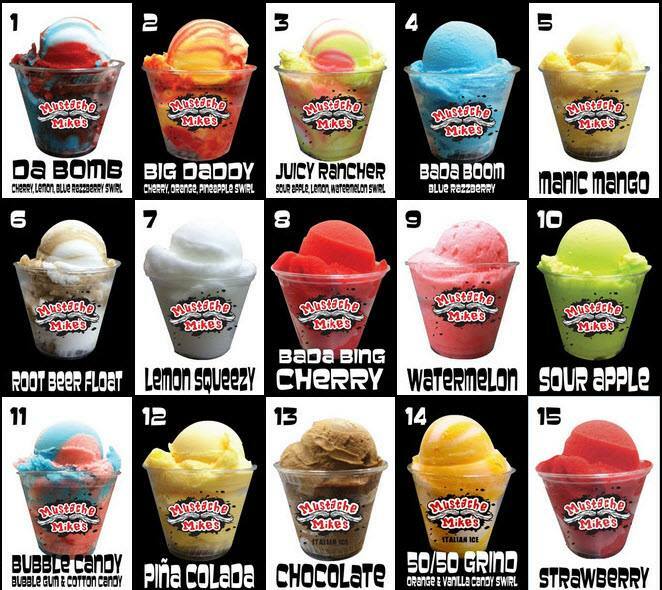 We have over 150 different flavors of our mouth watering authentic Italian Ice ~ from the traditional Lemon, Cherry, Blue Raspberry, Chocolate…to the more exotic flavors such as Strawberry Banana Twist, Pina Colada, Passion Fruit, Almond Rocca, Mokaccino, Orange Pineapple, Mai Tai and many~many other delicious flavors! Additionally we also provide ice cream bar dessert catering (w/traditional creamy ice cream) to serve your best Bay Area dessert catering needs. We got ‘cha taste budz going, didn’t we?! Invite us out to your next event or hire us for your Bay Area Italian Ice Cream Cart Catering or Ice Cream Truck Catering needs! Nope, this is not shaved ice catering or snow cone catering (where it’s just a pile of ice w/syrups poured over) but rather a more premium and smoother quality treat that just melts in your mouth.